This is a figurative vision, limited by the capacity of the human mind (Isaiah’s) as he is about to look into God’s temple, the most holy place. The prophet, who is standing outside the temple, sees the God, raised over the ark of the covenant, between the cherubim and seraphim, and God’s glory filled the whole temple. This vision is explained, John 12:41, John 12:41 “Isaiah said this because he saw Jesus’ glory and spoke about Him.” John mentions this as full proof that Christ is God. Our imagery must be to see God seated on a throne of grace; and through Christ, the way into this of holiest places is made open to us. God’s temple, His church is the earth, filled with His glory. The train of God’s robe, filled the temple, the whole world, for all that exists is God’s temple. And yet God can dwell in every contrite heart. Isaiah stands recognizing that he is not worthy to be where he is. He is sinful. Instead of horror, God’s very own attendants begin to attend to Isaiah. Who ae the seraphim? Seraphim are the traditional angels of heaven, they are the ministering spirits who live near us and do so much for each of us Their name means “burners;” they burn in love to God, and zeal for His glory against sin. The seraphim showing their faces veiled as a declaration of obedience to all God’s commands. 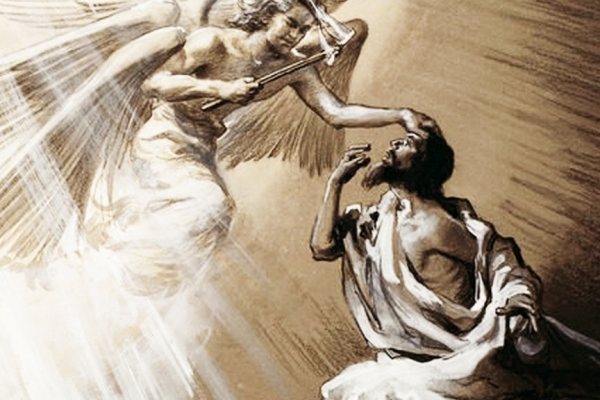 The seraphim do not understand the secret reasons of God’s counsels, government, or promises. All vanity, ambition, ignorance, and pride, will be done away by one view of Christ in His glory. This vision overwhelmed the prophet with a sense of his own vileness. We are completely undone if there is not a Mediator between us and this holy God. A glimpse of heavenly glory is enough to convince us that all our earthly righteousness’s are no more than filthy rags. No man dare speak to the God, if he saw the justice, holiness, and majesty of God, without discerning the glorious mercy and grace in Jesus Christ. The live coal may denote the assurance given to the prophet, of pardon, and acceptance in his work, through the atonement of Christ. The taking away sin is necessary to our speaking with confidence and comfort, either to God in prayer, or from God in preaching; and those shall have their sin taken away who complain of it as a burden, and see themselves in danger of being undone by it. It is great comfort to those whom God sends, that they go for God, and may therefore speak in His name, assured that He will stand behind them. How would you describe the characters in this story: e.g. God, Isaiah, the Seraphim? Why is each in the story? How would unforgiven sin interfere with someone’s ability to share Christ with others? If you are positive that God is behind your efforts, how does this lessen any concerns over your effectiveness or results? Clearly, Isaiah is called by God – What do you think a “calling by God” looks like today? When Christ had finished preaching, he told Peter to go back to the business of his calling, fishing. This example shows that the time spent on week days in public exercises of religion, do not have to be so great as to take up all of our time, and may help us prepare our minds for our worldly business. With what cheerfulness do we go about the duties of our calling, after we have been with God, and have our worldly occupation blessed by the Word and prayer! No fish were caught and they were disappointed and tired. Yet Christ told them to let down their nets once again. Jesus shows us that we must not abruptly quit our worldly callings because we have not had the success in them we desire. We are called to follow the guidance of Christ’s word in God’s world. The huge catch of fish was seen as a miracle. We too are like Peter, sinful people, therefore Jesus Christ has the right to just depart from us. It is up to us to call out and ask Jesus not to leave for woe to us if Jesus ever departed from sinners! Rather let us always call out to Jesus to come and dwell in our hearts and do so by our faith so that Jesus may transform and cleanse us. These fishermen gave up everything and followed Jesus, even when their calling, fishing, prospered. When riches increase, and we are tempted to set our hearts on them, but to give them up for Christ is the greatest gift. Now that you have read both an old and new Testament verse on a calling, what would you say are the elements of being called? Are these the same for every Christian or just for those who become ministers? How are both different and similar to one’s personal salvation? What makes you follow someone? In other words, become an apprentice of sorts? How do you know what your own personal calling is?